Dr. Jochen A.G. Jaeger studied physics at the Christian-Albrecht University in Kiel, Germany, and at the ETH Zurich. He received his PhD from the Department of Environmental Sciences at the ETH Zurich. He held a position at the Centre of Technology Assessment in Baden-Württemberg in Stuttgart, Germany, and lectured at the University of Stuttgart, Germany. From 2001 to 2003, he was a postdoctoral fellow with Dr. Lenore Fahrig in her Landscape Ecology Laboratory (Department of Biology Carleton University, Ottawa, Canada). From 2003 to 2007 he was a research fellow at the ETH in Zurich funded by the German Research Foundation DFG. He is currently conducting three research projects about the drivers of urban sprawl in Europe, the effectiveness of wildlife passages along a major highway in Quebec, and the role of uncertainties in environmental impact assessment in Canada. 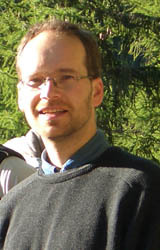 He is working in the fields of environmental indicators, the quantification and assessment of landscape structure and landscape change, landscape ecology, road ecology, urban sprawl, ecological modelling, environmental impact assessment, and novel concepts of problem-oriented transdisciplinary research. 1. ETH-Life reports of December 2005 and May 2006 about the project on measuring the degree of landscape fragmentation in Switzerland (funded by the Swiss Federal Roads Authority ASTRA and the Federal Office for the Environment FOEN): 1st Report (Dec 2005) (PDF)/ 2nd Report (May 2006) (PDF). Roads and traffic affect animal populations detrimentally in four ways: they decrease habitat amount and quality, enhance mortality due to collisions with vehicles, prevent access to resources on the other side of the road, and subdivide animal populations into smaller and more vulnerable fractions. Roads will affect persistence of animal populations differently depending on (1) road avoidance behavior of the animals (i.e., noise avoidance, road surface avoidance, and car avoidance); (2) population sensitivity to the four road effects; (3) road size; and (4) traffic volume. We have created a model based on these population and road characteristics to study the questions: (1) what types of road avoidance behaviors make populations more vulnerable to roads? ; (2) what types of roads have the greatest impact on population persistence? ; and (3) how much does the impact of roads vary with the relative population sensitivity to the four road effects? Our results suggest that, in general, the most vulnerable populations are those with high noise and high road surface avoidance, and secondly, those with high noise avoidance only. Conversely, the least vulnerable populations are those with high car avoidance only, and secondly, high road surface and high car avoidance. Populations with low overall road avoidance and those with high overall road avoidance tend to respond in opposite ways when the sensitivity to the four road effects is varied. The same is true of populations with high road surface avoidance when compared to those with high car and high noise avoidance. The model further predicted that traffic volume has a larger effect than road size on the impact of roads on population persistence. One potential application of our model is to generate predictions for more structured field studies of road avoidance behavior and its influence on persistence of wildlife populations. Published in Jaeger et al. (2005), Ecological Modelling, 185, 329–348 (PDF).